This broadside was commissioned by the poet Joan McBreen and published by Artisan House Editions, based in Letterfrack, Co.Galway. 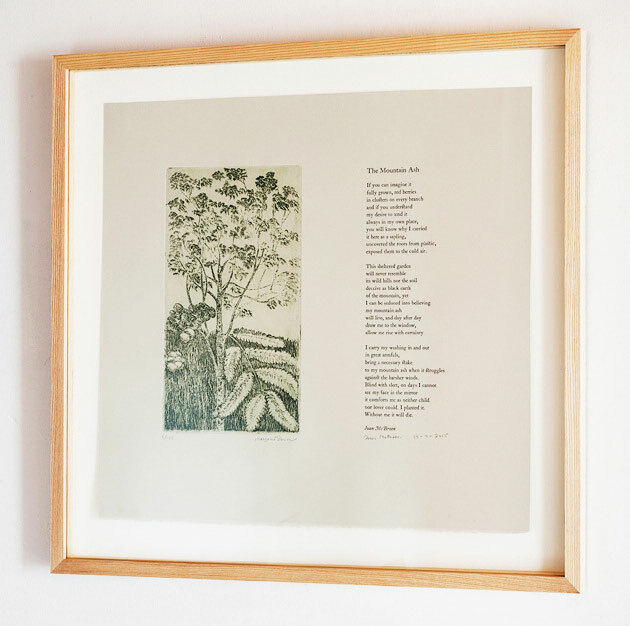 Artisan House, run by Mary Ruddy & Vincent Murphy, asked me to design and set the text of the poem, The Mountain Ash, to accompany an etching by the artist Margaret Irwin West. The finished broadside was launched to a great response at the Clifden Arts Festival on the 19th September by the poet Des Kavanagh. It was a pleasure to work with Mo Irwin. We had a number of discussions by phone about how the etching and text would work together and the logistical details of the two printmaking methods. Mary and Vincent oversaw everything, keeping in great contact with Joan, Mo and myself. Tony Curtis was persuaded to sing a song about the Rowan tree! The broadside was produced in a limited edition of 150 copies. Mo’s etching of a Rowan tree with detail of the leaves is presented beside the text of the poem set in 18pt Caslon Old Face. Mo printed each copy of her etching herself on her press at her home outside Clifden, Co Galway. I then set the text of The Mountain Ash at The Belgrave Private Press and printed it on the large Farley proofing press at Graphic Studio Dublin. The typeface chosen was Caslon, in part due to Joan’s affection for the broadsides of the Cuala Press printed by Elizabeth Yeats and featuring the images of Jack Yeats. The broadside was printed on BFK Rives grey paper which gives a great richness to the final piece. In advance of the launch, 30 copies were framed in a waxed ash by local framer Pete Coneally and the remaining copies are presented in a cloth bound folder. It was my first time at Clifden Arts Festival and I was sorry I couldn’t stay longer. The “singing in the bookies” evening sounded particularly entertaining!